We get a lot of pruning questions at Fairview. Pruning is both an art and a science. 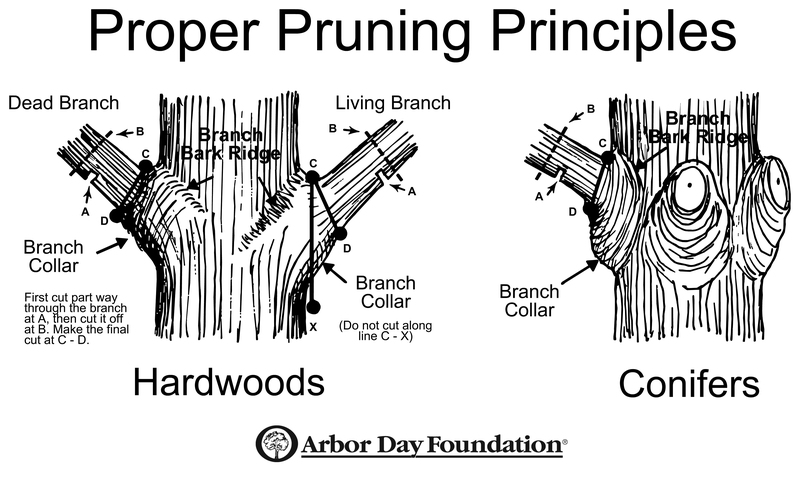 Hopefully this guide will help answer some questions regarding the timing of pruning. We will leave the artistic side of pruning to another article. The best advice that I can give someone about pruning is to learn a little about what you are doing, and be bold! Do not let the act of removing material from live plants scare you. Pruning, when done properly and at the correct time of year, can be beneficial to your garden. A good rule of thumb for pruning is this: If your tree or shrub blooms in the spring season, prune it after it has flowered. If your tree or shrub blooms in the summer or fall months, prune it in late February. There are exceptions to this rule, and I will try to cover them in this guide. The reason for pruning two separate ways is that spring flowering plants typically set their flower buds during the late summer or early fall months. Summer flowering plants generally set buds on new growth which forms in spring. Other plants that are grown more for purposes other than flowering should be pruned during the late winter season. This includes plants like holly, nandina, privet and other common shrubs in the landscape. This is a list of trees and shrubs that flower in the spring and should be pruned in the period after they finish flowering, but before the end of June. This is a list of plants that flower in the summer and should be pruned in the late winter season (mid-late February). When considering pruning a plant, two questions should be answered before you start. (1)Why does the plant need to be pruned? Is it too big? Has it gotten unsightly? (2)How does it need to be pruned to accomplish the goal? 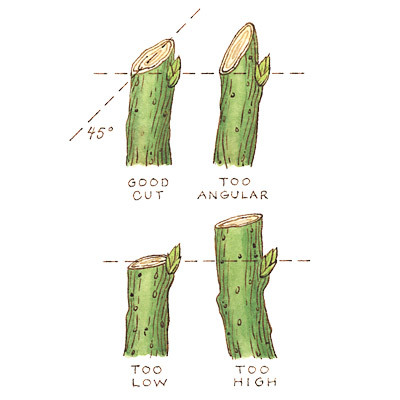 Pruning can be accomplished using one of three different methods of pruning. 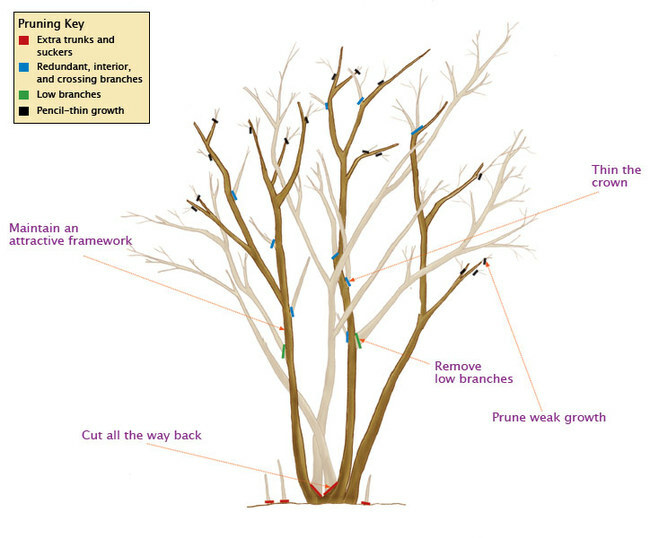 Thinning, shearing, and heading back can be the most useful techniques of pruning. Thinning cuts can be utilized on large, dense plants that have lost density at the base, or where flowering ability has been reduced. Thinning involves removing branches from the base of small trees or shrubs so that light can penetrate through the upper canopy. This stimulates growth from the base of the plant and can help fill out evergreens or promote new flowers in plants like forsythia. Heading back is a method where you remove plant growth from the top, and reducing size up to a third of the total height. Shearing is what I see most commonly done in the garden, if it is the correct choice for the situation or not. Firing up the motorized shears and boxing or rounding off shrubs can reduce the overall size of the plants, but in some cases, heading back is the more appropriate method that should be used. -Remember the three D’s, dead, diseased, and deranged. Dead wood, diseased material, and “deranged” limbs (those growing in crazy directions) can be pruned at most any time of year. -Try to avoid pruning from mid-September through the end of December. 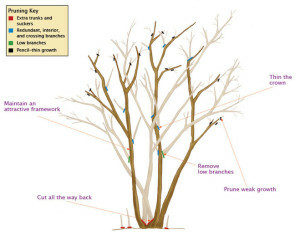 Pruning can stimulate new growth to form. New foliage can be damaged by cold temperatures in the fall months. -Use the proper equipment. Sharp bypass pruners, loppers, or pruning saws work best. Try to avoid anything that is motorized. It is too easy to make mistakes with chainsaws and electric shears. -Avoid pruning plants that are stressed. 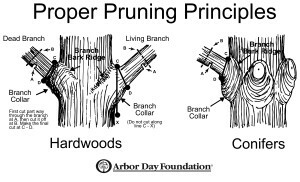 -Pruning fruiting trees and shrubs requires more extensive knowledge. Check with a professional before pruning. -When pruning, take frequent breaks to step back and look at the plant as a whole. 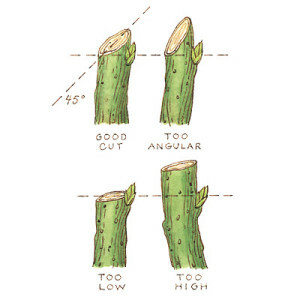 This will prevent you from pruning too much and help shape the plant more easily.